In my last post I shared my new spring tablescape with you. Well, when we had dinner the other night, the sunlight hit it in such a way that magical sparkles were thrown everywhere and I just had to share it with you! So beautiful and unexpected! Sadly I'd temporarily moved the yellow/gold rim soup from the white place setting and didn't notice it was missing when the sparkles appeared and I ran for the camera. Would have been even prettier! Sooooo magical! 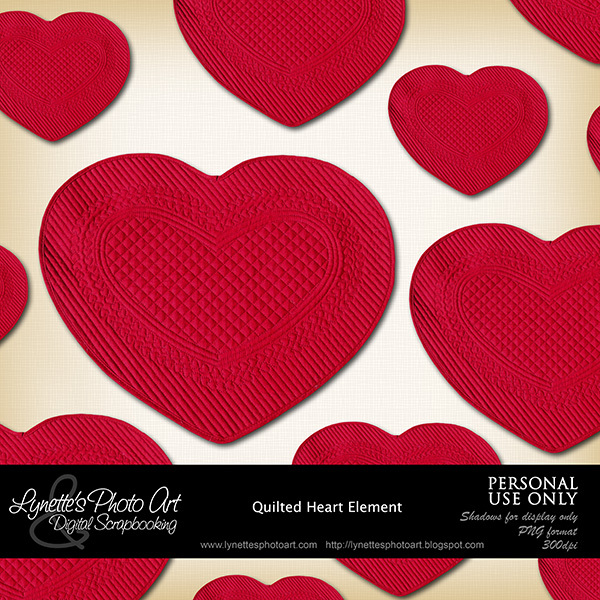 I have a pretty freebie for you today to use on your Valentine layouts. Click the download link at the bottom of the post to snag it. I have bundled together tons of gorgeous Valentine/love/romance elements and hybrid projects that I have given away in past years into a kit that you can purchase here. Thank you for supporting this blog! I do so appreciate every one of you who have come here for so many years! Hugs! The last two years have been exceedingly challenging for me and my daughters. I spent all last year and this year so far recuperating from many surgeries, procedures and miserable tests sitting/laying in one place on the sofa. I find that after fifteen years of the same everything in my home, I am longing to change the look of my living space. Lacking physical ability and funds, mostly it's not happening. With all the work we did rebuilding and refurnishing my daughter's house after the tornado (two years ago this coming April 27th), I receive the Pottery Barn catalog...and almost daily e-mails! Ahhhh! I no longer need these as we've finished her house, but the catalogs make perfect Magazine Trees, so I haven't stopped them coming. But it makes a woman long to redecorate! 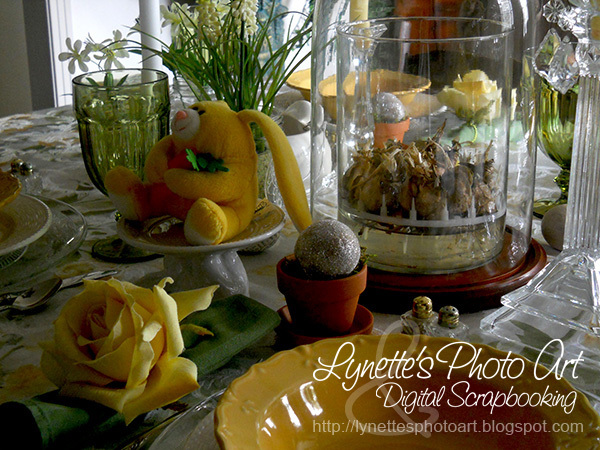 I have shared my spring/summer and fall/winter tablescapes with you in the past. Simple but I have loved them. I've used them for maaaaany years now. My house is rich muted colors like burgandys and rich greens with cream accents etc. So, my fall/winter table is the same, dark and rich. Right now, all that rich and dark, along with closed windows night and day so we can see the TV (bad reflections) as I recover, has just closed in on me. I want light and fresh, and NEW!!! My dining and living room are small and all one space, so I see the table all the time... :) which is why I keep it set, so pretty! 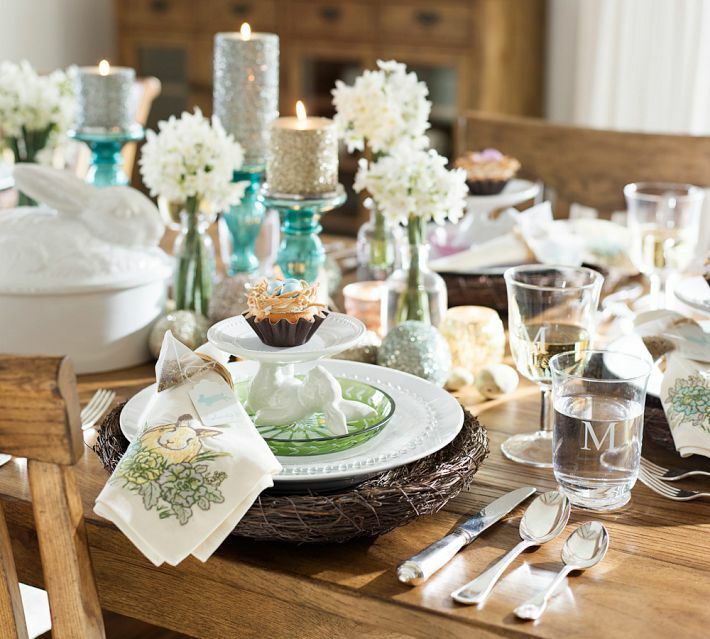 I loved the all white dishes embossed with bunnies that Pottery Barn had last year, but it wasn't a possibility. 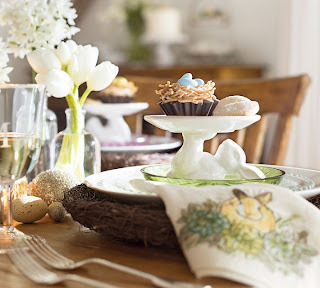 I especially fell in love with the little upside-down bunny cupcake stand last year, which sold out immediately. When I got my new catalog a couple of days ago, I was overjoyed to see they brought him back! 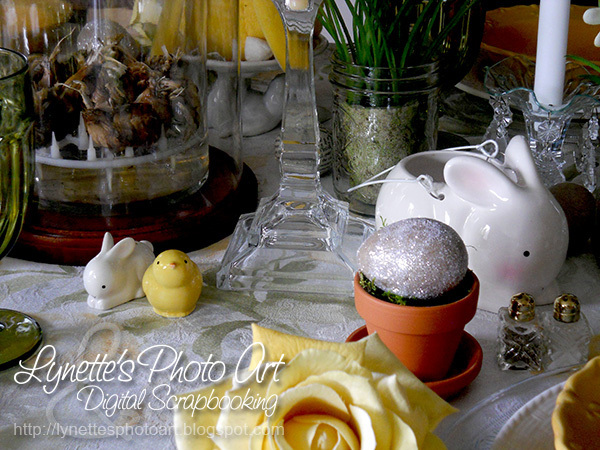 I wanted one to put in each place setting like they did. He's soooooo cute! Time for a sidenote...I get that things sell out and Ebay is a great option for people to grab what they missed, if they are willing to pay the huge mark up. But what I don't get is things like this bunny...he's still available on the Pottery Barn website, with FREE shipping and is still in stores for $14.50, but I see them on Ebay for up to $69 each???? Are people really not checking the store before they buy from Ebay? And the little bunny with the egg hole in his tummy is only $8, and available, but it's on Ebay for $39.99??? Ok, I'm done! Let the DIY begin! The look of this table relies heavily on clear glass and solid white and spring flowers. 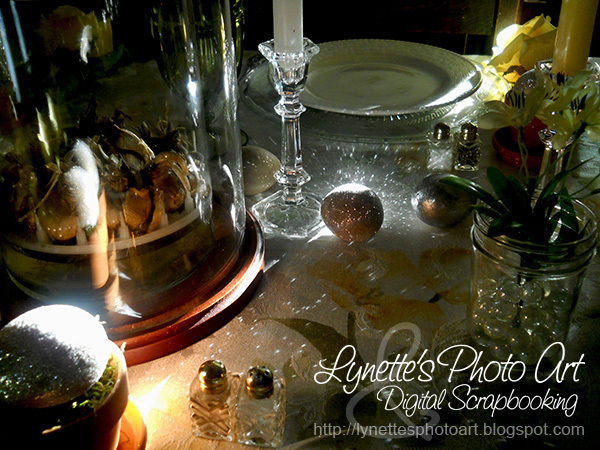 They have smaller clear glass plates rimmed in glass balls that sit inside white plates. I had four white plates I bought for $1 each many years ago, check! I found three beautiful clear glass plates for $4 each in the clearance isle at Hobby Lobby. They were charger size! There was a small hole in the centers from where they had been parts of two tiered stands. As chargers, it would never be seen. But I needed a fourth. I found one of the original stands in another clearance isle. It was in bad shape and I asked if they'd let me have the big plate to make four chargers. They agreed, if I'd buy the smaller one for $2. Done! So far I had the glass chargers, white plates inside, then I used the rim soup bowls from my regular spring table. My yellow/gold bowl inside the white plate looks like one of those two colored daffodils! I got that 16 pc. set from Walmart for $16 many years ago. Sadly my bunny doesn't fit nicely in the bowls. :( Well, that's good and sad. Sad I can't make the look they had, but good that my table looks great with only one of him (not in a place setting), saving a fortune! I want to address is the "nest" chargers. Too wonderful yes? But way expensive times how ever many place settings you need. 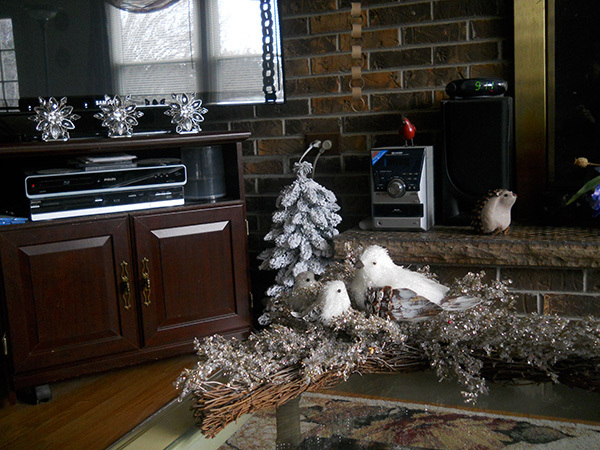 At Hobby Lobby I found narrow vine wreaths for $4 a piece that would work well. Just sit the plate in the wreath! They had a tiny one that would go on top of the bunny cupcake stand too and you could add moss to the center and fill as you wished. I didn't buy these as I had already bought the glass chargers. I have my Mother's clear glass coasters that are rimmed in the same glass balls as the Pottery Barn plates! I also have a gorgeous crystal serving bowl (gotten at an outlet mall 15 yrs. ago for almost nothing, but is indescribably beautiful), and a beloved clear glass pitcher, also from 15 yrs. ago. LOL are you starting to figure out that I had to start life over with nothing 15 years ago??? Yup! 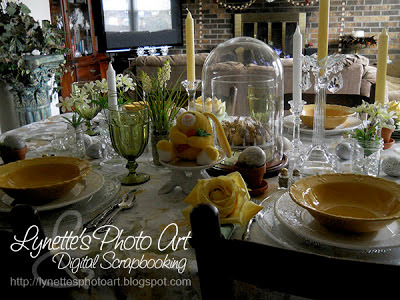 These pieces look gorgeous on the table, but are too much for every day without the leaves in Mom and Dad's old table. But they'll be great when there's enough company for the long version of the table! I'm using my same spring tablecloth (Bed, Bath & Beyond) and green fabric napkins (Walmart) and yellow flower napkin rings (Bed, Bath & Beyond) - all still perfect after 15 yrs.! It's a cherry table, but so badly in need of refinishing that I always use a tablecloth. Warms and brightens the space too! The tiny glass salt and pepper shakers came with a huge set of things very cheaply...15 yrs. ago. LOL! They are always on the table. 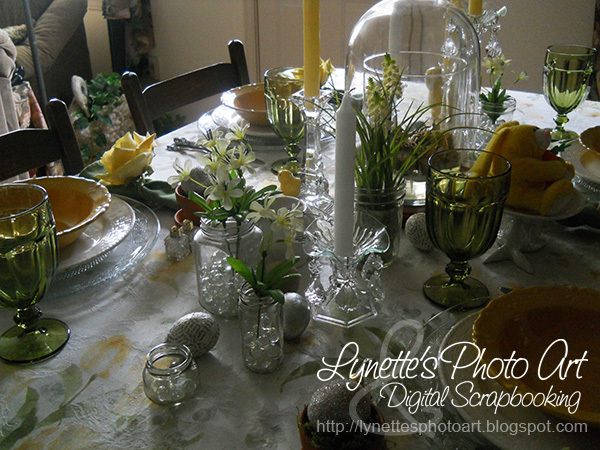 I used the crystal candlesticks that I always have as a centerpiece. They were $15 at Service Merchandise before they closed years ago. I mixed white and yellow candles ($.68 each Walmart - I don't burn them so they last forever!). I haven't mixed colors before but adore it on this table. I had two fancy crystal dangled things from ... yep, 15 yrs. ago and they look great mixed in. Ok, up to glasses. These are Libby's Gibraltar that I got from Walmart for $2.37 each many years ago. Sadly they don't make them in colors any more. I had three colors. Now you have to go through somewhere like Replacements.com and pay a fortune if you want any. Next I needed an assortment of plain clear glass bottles for plants. I've saved unusual shaped jars for years...capers, pimento, artichokes, Ball jars, etc. So I broke them out and came up with a nice selection assorted in height and shape. I used clear marbles that had been my Mother's for vase filler. It's too early for flowers in the yard yet, so I spent $.97 for a stem at Walmart and divided them up into the jars, and got white grape hyacynths from Michael's for $5.97 and just dropped it in a Ball jar. It's pot was tiny enough that it works perfectly. As God blesses the yard in spring, I'll replace the fake with real. Years ago I got a large glass cylinder for forcing bulbs from Walmart. I believe it was under $10. 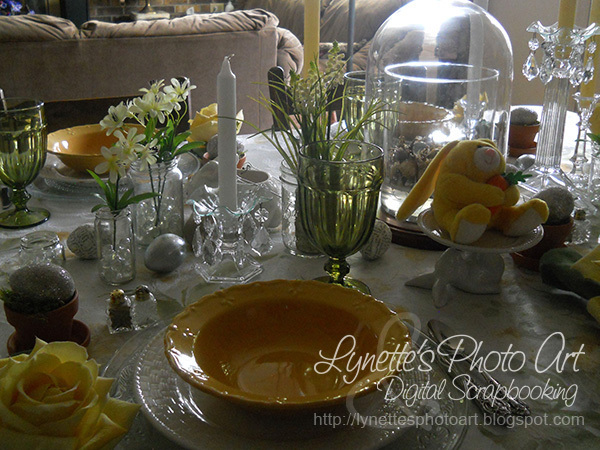 I set it in the midst of the candlesticks and bottles with bulbs to force in it and can just see it with spring green stems topped with cheery yellow miniature yellow daffodils up there with the white and yellow candles! I have always wanted to use those tiny terra cotta pots and saucers for eggs...so I did finally it! For $1.50 each at Michael's, I got four. I added moss I got from Hobby Lobby for $2.39 with a coupon (and tons left for another project). I wanted plain white eggs, but can't blow the real ones myself. I got a pack of 12 brown paper eggs from Hobby Lobby for $4.79 with a coupon. 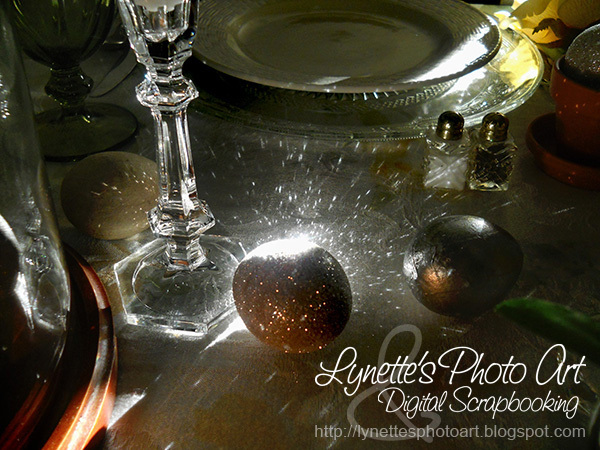 I love the natural unaltered paper egg, so I left some that way, but they didn't show up well in the "egg pots". I experimented and came up with three other looks I love with the unaltered ones! First I tried painting one egg white. FAIL!!!!! Then I covered it with Mod Podge and scraps from the old book pages that I'd saved from my Christmas projects. 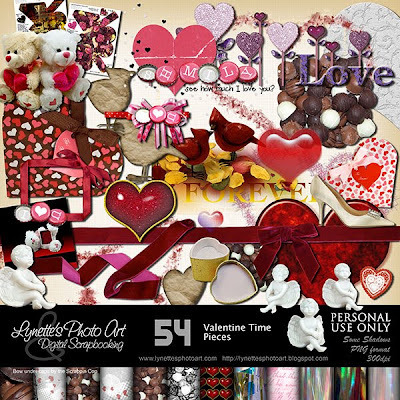 Once covered with random strips, I covered it again with Mod Podge and then lightly sprinkled it with Diamond Dust from Hobby Lobby that I got years ago in a huge set for $1.32 per set. Fabulous! This is the BEST glitter in the world! Then I covered an unaltered brown egg with Mod Podge and heavily sprinkled it with the same glitter. I kept sprinkling till no more would stick. Until it dried, it looked like another fail, but once it dried, I can't hardly stop looking at them!!!! Oh my goodness! The combination of the brown paper and that white very fine glitter is STUNNING!!! The fourth egg look is a result of repeated coats of Krylon's Chrome spray that I got from Hobby Lobby for $3.29 with a coupon. I love the un-evenness of how it went on. Some spots are shiny and smooth while others are more mat and rough. Perfect! And when I set all four eggs together I couldn't believe how fantastic they look together! Hope it comes through in the pictures. 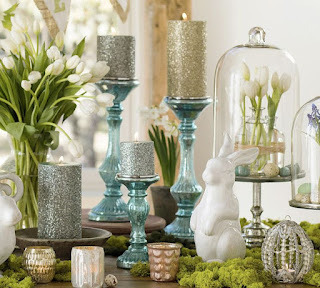 I wanted those Pottery Barn Cloches on the pedestals. I searched everywhere for parts that might be combined to work. In the end, I bought a cloche and base from Hobby Lobby for $13.50 on half price sale. I also bought a silver candlestick there on half price for $7.50. The plan was to use the Krylon Chrome spray on the wooden base to make it match the silver candlestick and attach them with E6000. Well, that paint isn't up to that challenge as I discovered on another piece of wood. Once I had put the terracotta pots on the table, the wood base of the cloche looked right, so I left it alone. Also, though it was the pedestal cloche that took my breath away, this looked right sitting flat on the table. For now, the bulbs I'm forcing are inside the dome. I don't know if that's ok or not, but I know it should further insulate them from my frigid house, which just might help them bloom. I plan to open it regularly for fresh air and see what happens. That left me with a silver candlestick and a smaller beautiful glass plate I had to buy in order to get my fourth charger... :) Yup! It makes a gorgeous, and MATCHING cake stand/pedestal thing. The tiny hole in the middle of the plate was capped by one of those clear epoxy circles for scrapbooking and looks like it was made that way. I attached them with E6000 that was $2.39 with a coupon at Hobby Lobby. 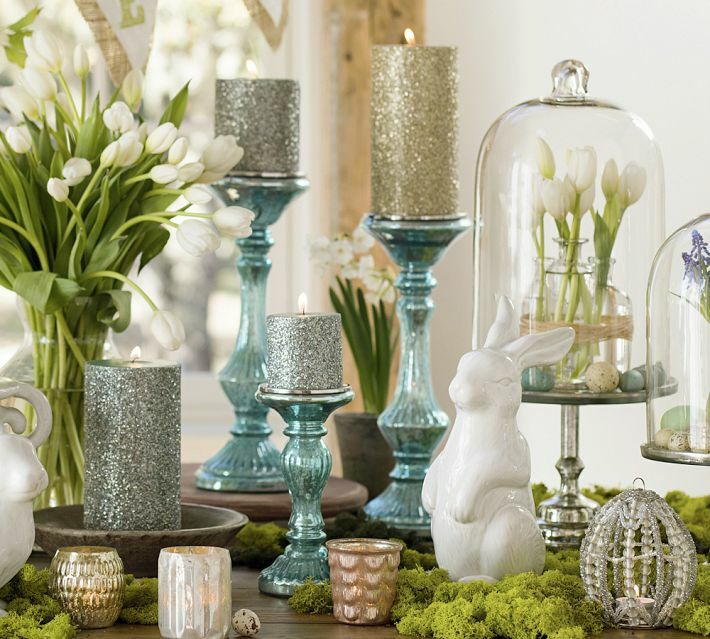 As to the spring babies that inhabit the table, you met the Pottery Barn bunny. The stuffed yellow bunny on top of him was an after season sale at Kroger many, many years ago. And the same for the bunny and chick salt and pepper shakers and ceramic baskets, only their clearance sale was at Kohl's and they are by Hallmark. I adore them in their simplicity! So, my look isn't the same as this year's Pottery Barn, but it has the same feel and surely brightens up my home, using mostly things I already had! It's funny, with living and dining rooms all one space, what would you say if I told you that the dining room is overflowing with this spring tablescape, and my living room still has my favorite winter touches? It's working for me. 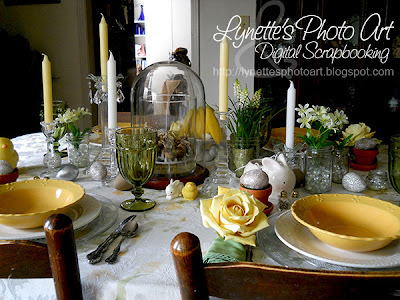 It is still cold, especially in my house, so the best of winter works, but the light, life-filled promise of spring is just a glance away in the dining room! It's like a visual representation of our walks as Christians, that we live in this world and experience the good and bad like everyone else, but we keep our eyes focused on the fulfillment of God's promises to us that are just around the corner and no one can keep from us! That just fills me with joy! I hope it does you too! Thanks for stopping by and I hope something I have shared here might give you an idea of something you'll want to do in your home!